a quilt is nice: blue? what do you think? do you like the blue? would it look better all orange with blue binding? I'm pretty sure I like it (mostly because i don't want to redo my setting blocks), but this is going to be a large quilt, bigger than I normally make...I really want to get it right. I showed it to my husband and I got a mediocre response out of him, so now I'm having second thoughts. I've never designed a quilt top (although I've hand quilted some), so my opinion may not carry much weight . . .
. . . I really like the blue and orange together. I guess I prefer contrast to monochromatic. hello beautiful quilt! this is so CHEERY! I love it. 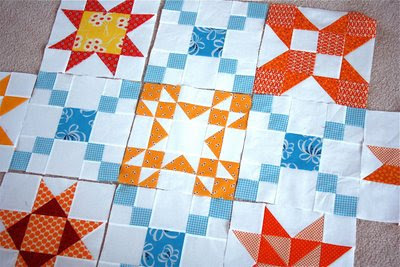 i must make an orange and blue quilt for myself now. You know, all orange would be really cute, but I happen to really like the blue with it. I think, at this point, it's personal preference. Do you feel like redoing orange setting blocks? Cause, really, the blue is darling. for me...definitely keep the blue...it adds whimsy! I love the blue! It gives the quilt a "happy" feeling when you look at it! Besides, I am Florida gator fan at heart (orange & blue are their school colors)! I recently found your blog and I am completely drawn to it! Your colors drew me in and made me want to take everything! i like it. i've said it before, anything you touch turns to gold. so just go with it, and i guarantee it will be the dolce and gabbana of quilts. ps i got my clips today! thanks! i am sending a little something something for morgan. Jodi as Simply This That and the Other sent me over. Oh I LOVE the blue and orange combination. You get my vote to keep it as is! Love your photographs. I like it. It is a modern combination of colors......so you are a 'with it' girl. i love it! (i'm super into orange and bright/aqua blues lately) however, if you did do it all orange with blue binding it would look super good too. hard decision. I really really love it the way it is with the orange and blue. I think it gives the stars a chance to really shine. Well its darling. I usually don't ask my husband's opinion. I guess thats why I started a blog!!! I love this quilt. oooh! i love it. keep the blue! it seems that you have the extremes of warm and cool, so maybe a warm tone setting blocks would work better? 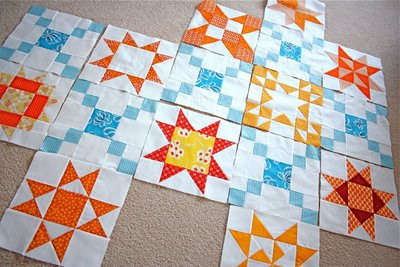 You could always make another mini quilt out of the blue setting blocks! 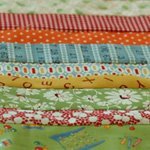 I found your blog through a link on Crazy Mom Quilts. If it isn’t too late to have an opinion on the blue setting blocks here is my two cents; I would never have thought to combine blue and orange but I really like how the colors work together. Once the machine quilted is done I think this is really going to be incredible. I love this quilt. I just found your blog and I love it. I am working on a purple and white quilt now but after seeing all your quilts I wish it was white with bright colors. I wonder what you did with this? I'm partial to the colour combo because this is what we have in our living/dining room. I love the blue & orange. It's just lovely... likely just not hubby's thing! I'm with the majority - you should keep it just the way it is. It is such a cheerful quilt top! It's beautiful!! I love the blue with it! :) I think the blue helps draw my eye to the orange. Nice work!